I bought one of those cheap wood moisture meters on sale for $25 at Princess Auto some time ago. I never actually tried it out until I cut up some fresh lumber on my bandsaw and wanted to get some measure of how fast it dried. Unfortunately, the moisture meter didn't last very long. Knowing that probe penetration into the wood makes a big difference in terms of how well they make contact, I kept tapping the meter in with my wrist. It took some very firm taps to get even minimal penetration into the hardwood, but after just a few readings, it stopped working. When I popped it open, I saw that the probe points were soldered directly into the circuit boards. 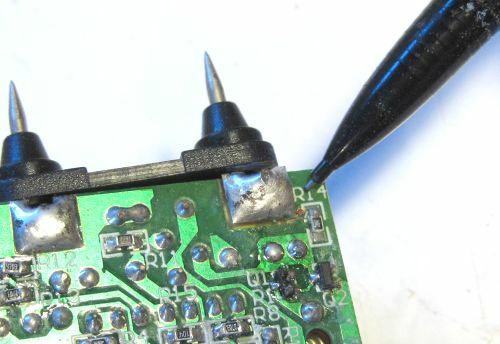 One of the pads had come off the circuit boards and the trace to the next circuit component (right where the pencil tip points to) was broken. With such flimsy construction, there wasn't much sense trying to repair the damage. It would just break again next time I'd use it. So I set out to make a new set of external probes for the meter. These would be probes that I could drive in with a hammer. I started with some long narrow screws and ground them to a point. Then I smoothed them to a shine with a buffing wheel. I figured getting the sides of the probes smooth would make it easier to pull them back out of the wood. I mounted the probes in some layers of white plastic that I had cut from a bucket. A block of UHMW plastic would have been better, but I didn't have any of that stuff handy. Normally, I would have been tempted to just use a block of wood to mount the probes in, but moisture meters work by measuring conductivity of the wood. If I mounted the probes in wood, that would completely mess up my readings. 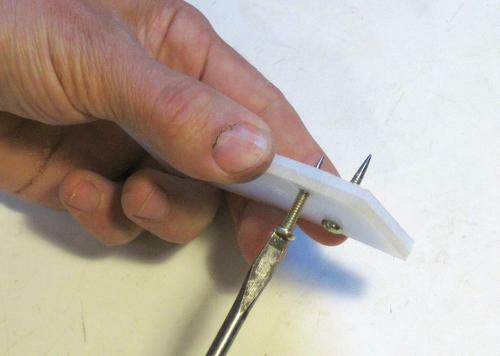 I put a nut over the points of my probes, then added three more layers of plastic over the points to serve as a limit for how far the tips could be pushed into the wood. 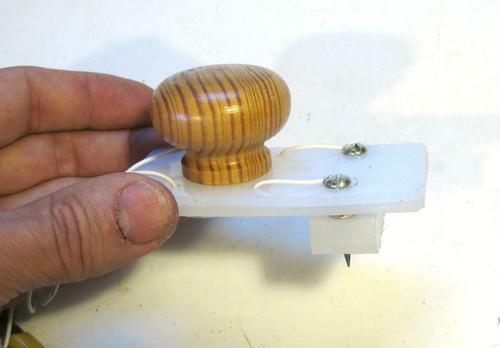 I also attached a wooden knob as a handle. I took the original probes out of the meter and just soldered some wires to where the probes used to be. 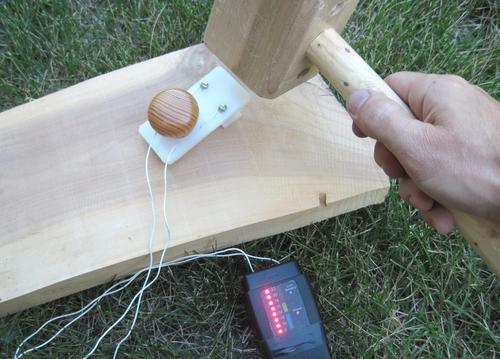 The probe unit can be driven into the wood with a mallet to ensure that it penetrates to full depth, even in hardwood. The piece of wood I'm checking here is still relatively fresh from having been sliced off a log, so it's still saturated with moisture. Next I researched how moisture meters actually work on the web. I found that all they do is measure DC electrical resistance of the wood, and use that to calculate moisture content. So I figured, why not just use a multimeter to measure the resistance and calculate the moisture content myself? The catch with this is that a typical multimeter will read up to about 20 megohms in resistance mode, and the resistance between the two probes for any "normal" moisture content is often in the hundreds of megohms. So the multimeter wouldn't be able to measure it. 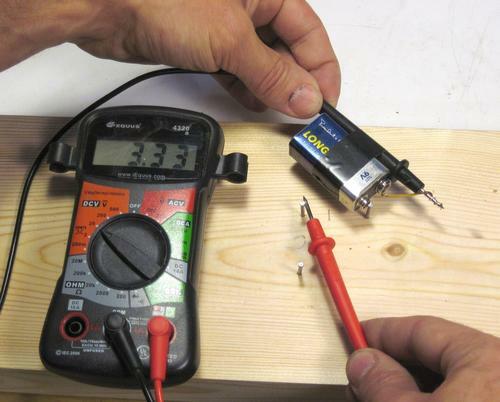 But there is a trick to measuring much higher resistance with a cheap multimeter. Most of these multimeters, when in voltage measurement mode, have an internal resistance of about 10 megohms. That is to say, the meter itself is like a 10 megohm resistor that just happens to display the voltage across it. 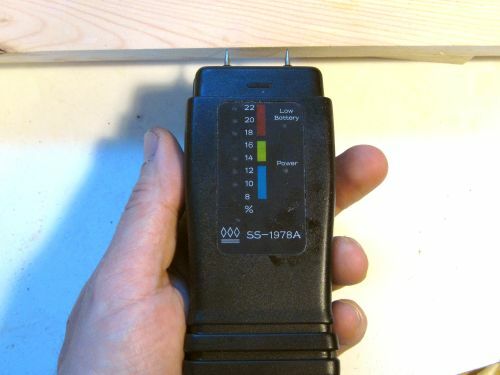 I checked, using another multimeter, that this meter was one of those with the 10 megohm resistance. So now if I use a 9-volt battery, and hook the volt meter and my wood probes in series with each other, the voltage drop across my meter and the wood will be equal to the 9 volts from the battery. And the voltage drops across the meter and the probes will be in the same proportion as their resistances. 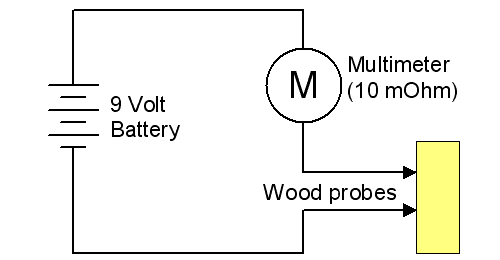 For example, if the wood between the probes has an 80 megohm resistance, my meter has a 10 megohms resistance, and my battery is 9 volts, I should see an 8 volt drop across the wood and a 1 volt drop across the meter. So if my meter reads 1 volt, I know that the resistance is 80 megohms. 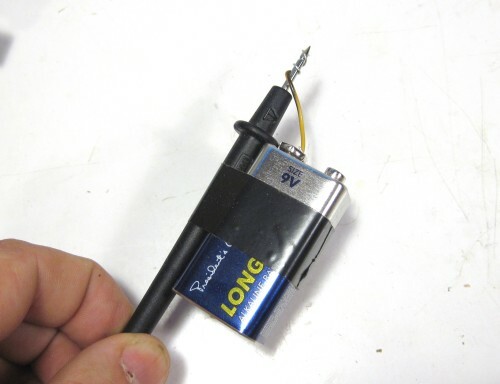 By taping and connecting a nine volt battery to one of the probes, we can now measure the voltage across the meter with the probes (two nails in the wood) in series with the meter. With the meter indicating 3.33 volts, we can solve for a resistance of 17 megohms. 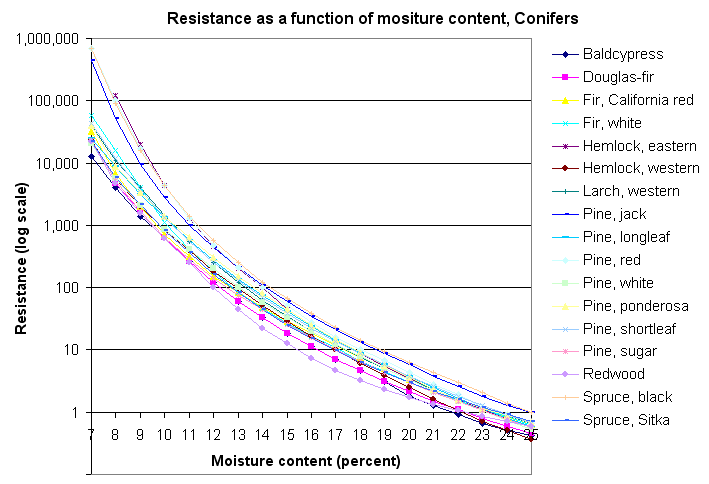 Now we can use the following resistance data to convert that to wood moisture content. This graph was generated from the data below. 1 Resistance measured in megohms at 80°F (27 °C) between two pairs of needle electrodes spaced 1-1/4 inches apart and driven to a depth of 5/16 inch. The reciprocals of these data are conductance in micro siemens. 4The values for this species were calculated from measurements on veneer. Unfortunately, the source data only indicates the depth of penetration, but not the actual diameter of the probes used to make the measurements. Much of the resistance is actually from the region nearest to the probes, as the cross sectional area that the electricity can flow across is only as large as the surface of the probes. For the distance between the probes, the current can spread over a much larger area. So the shape of the probes is actually more critical than the distance between probes. I figured a reasonable probe diameter would be a small nail. 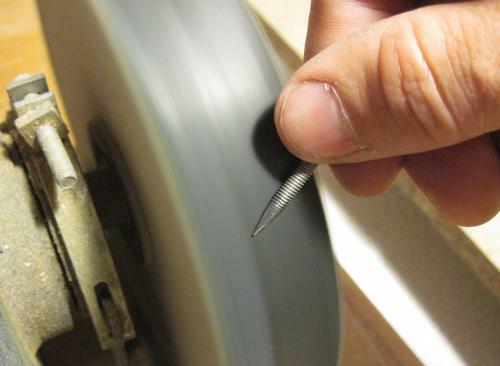 I'm using nails with 1.85 mm (.073") diameter. The next challenge is to drive the nails the same distance into the wood as was done for the source data above. I needed a penetration of 5/16" or 8 mm. 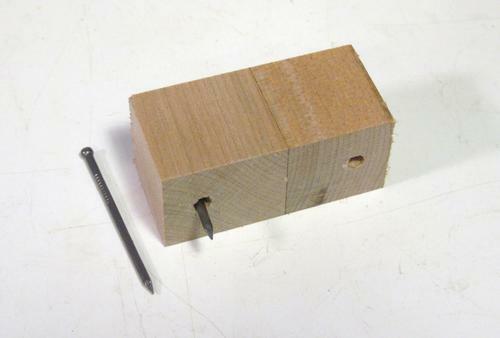 The easiest way to get the depth and spacing consistent was to make a block of wood that was 8 mm shorter than the nails, with two holes that the nails loosely fit into. The idea is to use the block as depth stop when driving the nails into the wood. 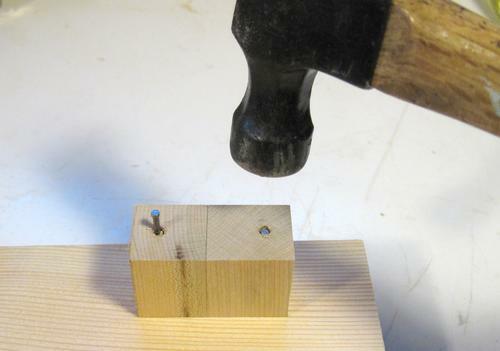 The block of wood is then removed to take a resistance reading between the two nails. An interesting property of wood is that for moisture content below 20%, resistance goes up almost exponentially with decreasing moisture content. Getting the resistance reading wrong by a factor of two will only throw the calculated moisture content off by about a percent. So getting the probe size and penetration depth exactly right is not that important. I did some experiments though and the resistance between the probes drops inversely with penetration depth. So if you want to get a deeper moisture reading, drive the nails 16 mm into the wood, then double your resistance reading to compensate for the deeper penetration before looking it up on the above table. 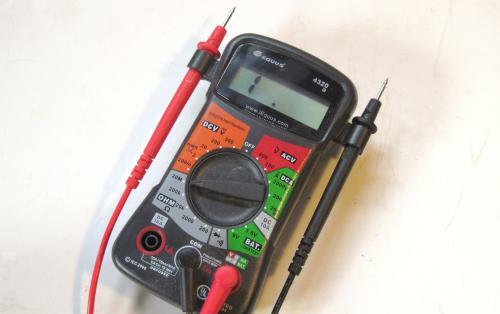 The approach can also be simplified by pre-calculating the whole table in terms of voltage readings on the multimeter. I recalculated the table for readings below 20% moisture content, so now all you have to do is look up the voltage on the table below to get the moisture content. This is for two probes about 1.8 mm in diameter, 32 millimeters apart, with 8 mm penetration. Note that cheap moisture meters don't even allow you to specify the wood species that is being measured. This causes a little bit of inaccuracy in the meters, but not too much. If you look at the resistance table (first table in this article), you will see that even though the resistance between species varies a lot, if you take a specific resistance and look it up in each row of the table, the closest values tend to be in the same or adjoining columns. So even if you get the species wrong, this will only result in an error of about one or two percent. I used the above table to do a few spot check comparisons with my cheap meter, and they come out pretty close. Though realistically, I think I'd trust my method more than the cheap moisture meter.